This is an artistic rendering of Act Five, Scene One of William Shakespeare‘s masterpiece. Hamlet, accompanied by Horatio, meditates on the frailty of human existence as he waits for his fiancée’s funeral procession. Eugène Delacroix was forty-one when this was completed and was at the height of his career. He had exhibited his Medea in the prior year and created a sensation at the Salon. 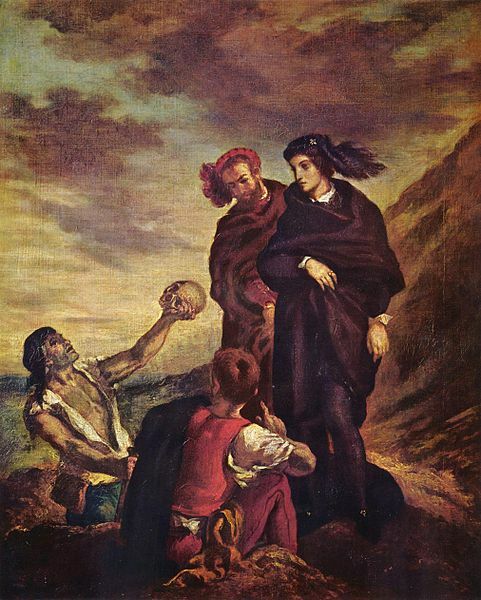 Delacroix produced several works based on this scene to explore Hamlet’s existential anguish.